This post is sponsored by The Quaker Oats Company. 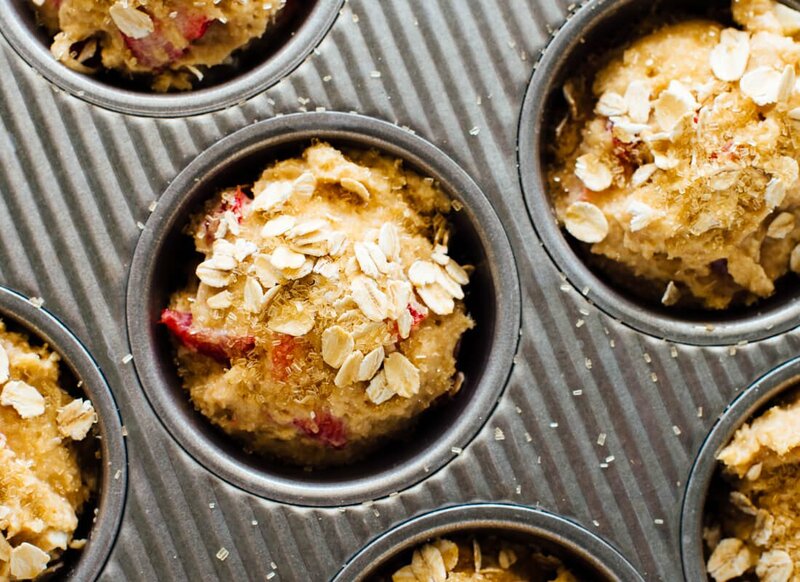 I’d take these strawberry muffins over strawberry shortcake any day! They’re fluffy and full of fresh strawberry flavor, with a delightfully sweet crunch on top. 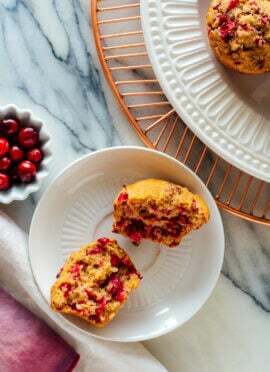 I like these muffins more than the average muffin, since they’re made with 100 percent whole grains, including whole wheat flour and old fashioned oats. 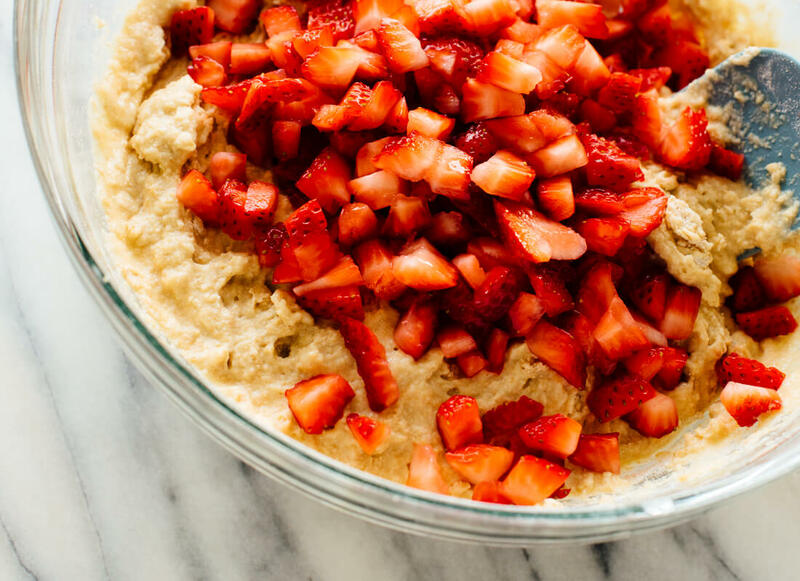 They’re also sweetened with maple syrup, which offers some extra flavor that complements the strawberries and oats. Greek yogurt rounds them out with a light sour cream-like tang. What more could you want in a muffin?! 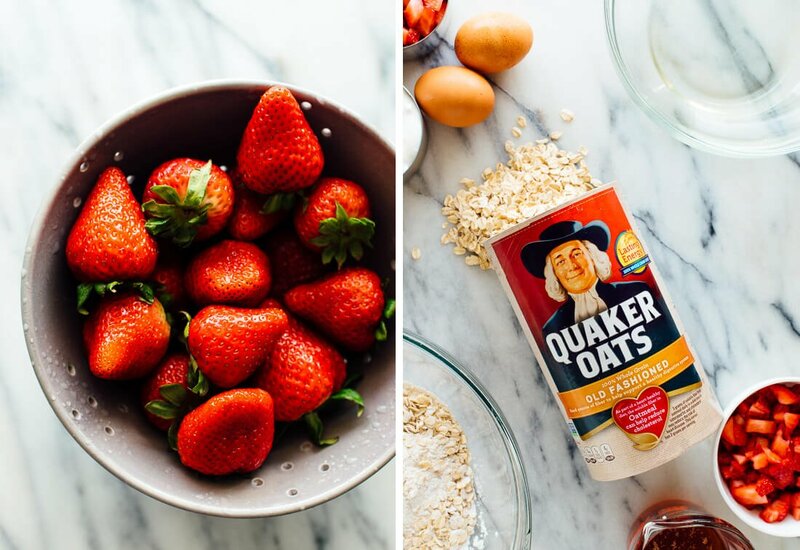 I teamed up with Quaker to create this recipe. After a bunch of recipe testing, I’m pleased to report that you can add up to 1/3 cup old fashioned oats to any of my muffin recipes. Sprinkle a couple of tablespoons of oats over the muffins before baking, too, if you’d like to add some polka dot-like visual interest (no sprinkles required). 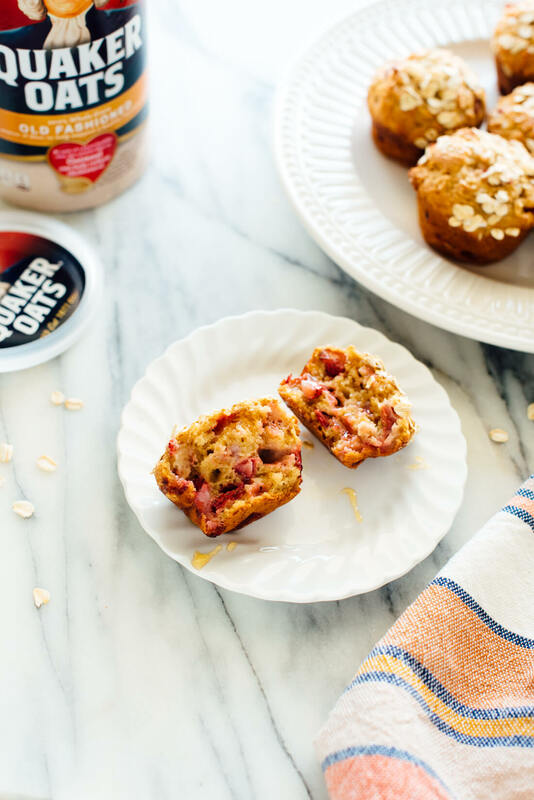 The oats give the muffins a more hearty texture, while contributing to the total amount of whole grains featured in this recipe. Most Americans fall short on whole grain consumption, so always keep the versatile oat in mind! You know I’m a big fan of whole grains, and I learned a fun fact when I was researching my cookbook. Did you know that old fashioned oats, quick-cooking oats, instant oats and oat flour offer the same nutritional values? They all start out as the same oat groats, and they’re just cut and rolled to into smaller and thinner pieces as you go down the line-up. I’m partial to old fashioned oats for their toothsome texture, but I’ve found that quick-cooking oats work great when you want a slightly more uniform texture in granola bars or cookies. I even used quick-cooking oats in the veggie burger recipe in my book. If you get lucky and your strawberries are pink and flavorful through the center, no need to hull them. If their insides are white and flavorless, remove that part with a paring knife before dicing. Use Greek yogurt, not regular yogurt—it produces a higher rise and more domed top. Any fat percentage will work. Sprinkle raw sugar on top of your muffins for a sweet crunch. Just a light sprinkle really makes a difference, but you can omit the raw sugar if you don’t have it. As always, please let me know how you like this recipe in the comments! I hope they become your favorite summertime muffins. 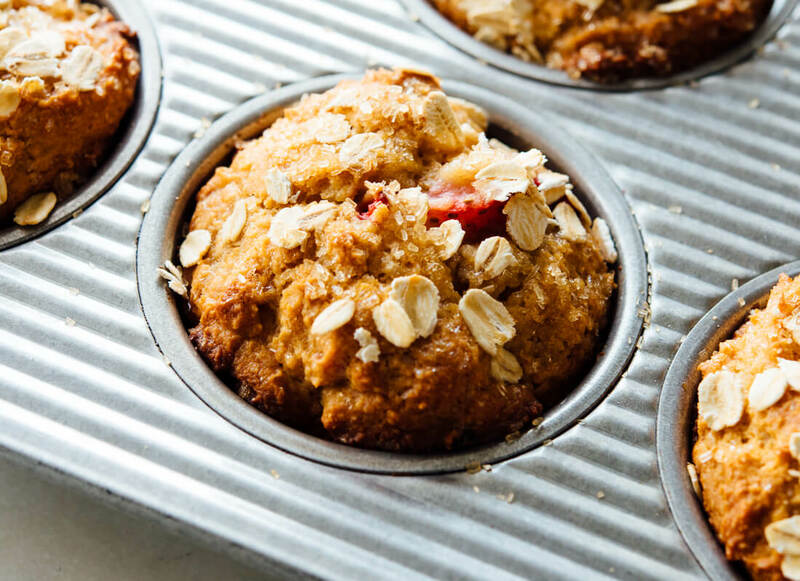 These wholesome strawberry muffins are fluffy and full of fresh strawberry flavor! Plus, they’re made with whole grains. Recipe yields 12 muffins. Preheat the oven to 400 degrees Fahrenheit. If necessary, grease all 12 cups on your muffin tin with butter or cooking spray (my pan is non-stick and doesn’t require any grease). In a large mixing bowl, combine the flour, ⅓ cup oats, baking powder, baking soda and salt. Stir with a whisk to blend. 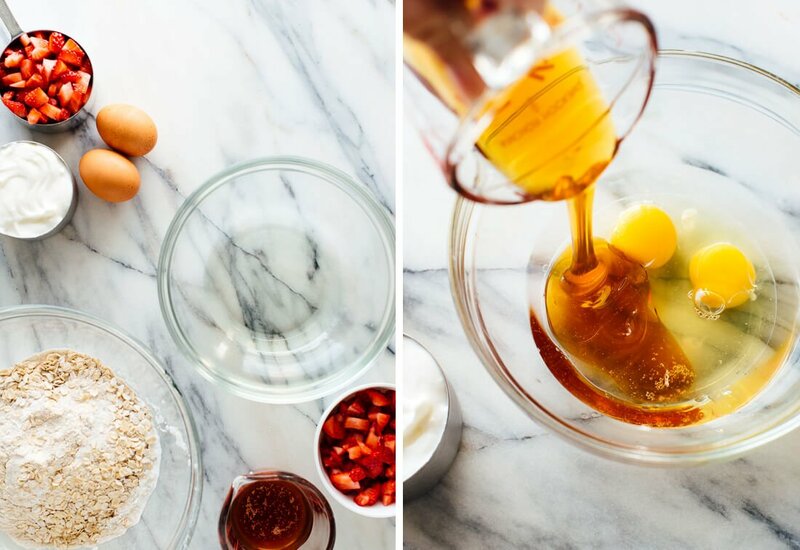 In a medium mixing bowl, combine the oil, maple syrup and eggs. 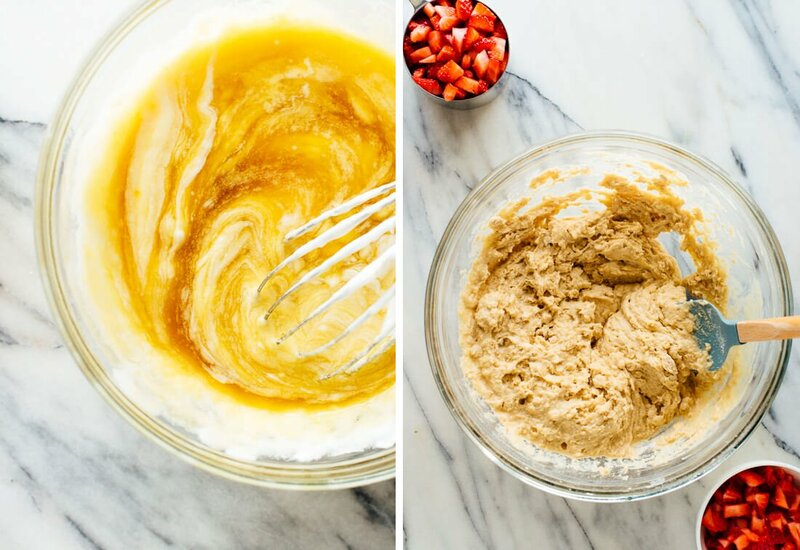 Beat together with a whisk. Add the yogurt and vanilla, and mix well. Pour the wet ingredients into the dry and mix with a big spoon, just until combined (a few lumps are ok). Gently fold the strawberries into the batter. The mixture will be thick, but don’t worry. Divide the batter evenly between the 12 muffin cups (I used an ice cream scoop with a wire level, which worked perfectly). They will be quite full! Sprinkle the tops of the muffins with the remaining 2 tablespoons of oats, followed by the turbinado sugar. Bake the muffins for 19 to 22 minutes, or until the muffins are golden on top and a toothpick inserted into a muffin comes out clean. Place the muffin tin on a cooling rack to cool. You might need to run a butter knife along the outer edge of the muffins to loosen them from the pan. Storage suggestions: Store leftover muffins at room temperature, covered, for 2 days, or in the refrigerator for up to 5 days. Freeze leftover muffins for up to 3 months. *Greek yogurt note: I’ve used a variety of fat percentages and the muffins have always turned out well. Higher fat yogurt will yield a somewhat richer muffin. Make it vegan: You can replace the eggs with flax “eggs.” Replace the yogurt with a smaller amount of vegan buttermilk—just mix ⅔ cup non-dairy milk with 2 teaspoons vinegar. Let it rest for 5 minutes before adding it to the other liquid ingredients. Make it dairy free: See vegan buttermilk option above. Make it egg free: Substitute flax eggs for the regular eggs—to make one flax egg, mix 1 tablespoon ground flaxseed with 3 tablespoons water and let it rest for 5 minutes before using (multiply as necessary). Make it gluten free: Substitute an all-purpose gluten-free flour blend for the whole wheat flour. This post was created in partnership with Quaker and I received compensation for my participation. Opinions are my own, always. Thank you for supporting the sponsors who support C+K! Hi – I substitute oat flour (I grind rolled oats in my blender) in place of whole wheat or white flour in all your recipes. It works great! I made you banana bread this am from your cookbook with the oat flour and it came out fantastic! Thanks kate!! Thanks for sharing, Carol! I appreciate the review. 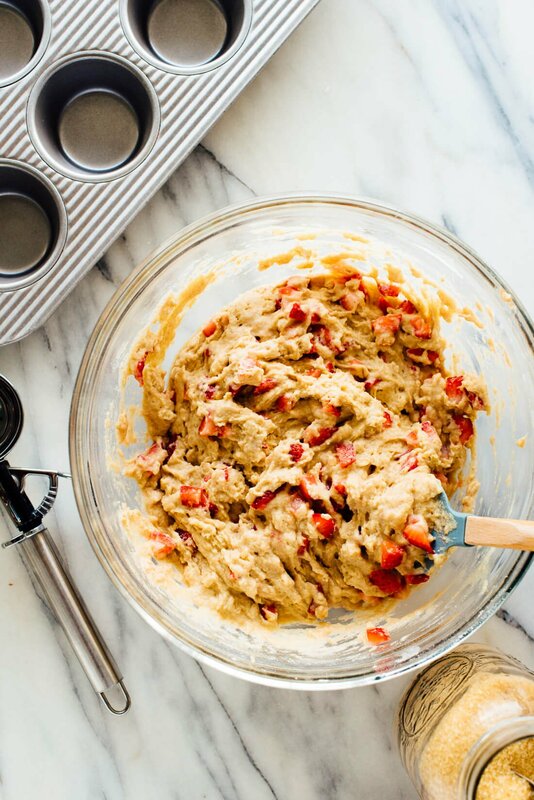 I wanted to make the strawberry muffins, but needed them gluten free…. All the gluten free flours are so different, I had no idea what kind to use…but the oat flour makes perfect sense. Thanks for the tip. What other fruit could go into the muffins if I don’t have strawberries on hand? Would frozen berries work? Hey Anya! You could use up to 1 1/2 cups frozen blueberries or raspberries, I think. Don’t defrost them; just fold them into the batter when you would add the sliced strawberries. I used frozen strawberries that were thawed and they came out great! Hi Kate. Thanks for this great recipe. I have a question – you mentioned that it’s possible to add 1/3 cup of oats to any of your muffin recipes (of which I have tried, and loved a lot!). How much would you need to reduce the flour if adding the oats? Thanks so much! Hi Kerith, good question! You actually don’t need to reduce or change any of the other quantities when adding up to 1/3 cup old-fashioned oats, in my experience. Think of them more as an add-in (like nuts) than flour, if that makes sense. I have been having quite the moment with making muffins lately! Love trying new varieties that are healthier too. I’ve actually never tried olive oil in muffins before…but I’m excited to try! Does it have a strong taste? Hey Brittany! As long as your olive oil hasn’t gone bad (rancid), the olive oil add a light-to-imperceptible flavor. You can also use coconut oil, which will impact the nutrition profile but it will work just as well as olive oil. Looks so delicious and perfect for weekend brunch! Amazing recipe! Going to try this one! Thanks! Let me know what you think when you do, Rylee! I just made the strawberry muffins with just-picked strawberries from the field and substituted the olive oil with organic MTC oil. They came out awesome – will be serving these as the shortcake part of strawberry shortcake for dessert tonight. Great recipe! Fresh picked strawberries, amazing! Thank you, Paula. 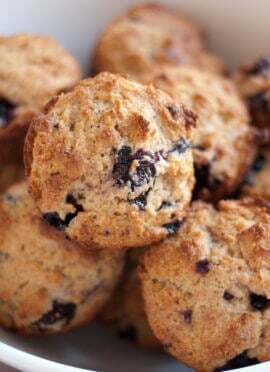 I made these with blueberries and I used agave instead of maple syrup. They are delicious! Very easy. Perfect timing, this recipe was in my inbox this morning, just as I was getting ready to make breakfast. Made them as written and they are delicious. My family enjoyed them too. I love that they are whole grain and use olive oil. Thanks for another great recipe! I love when that happens!Thanks for sharing, Pam. Thsi redipe looked devine. But Are you sure about 1/2tsp salt? Mine ended up super salty! Very unfortunate. Ari, I’m sorry to hear that! Yes, I use 1/2 teaspoon fine sea salt in all of my muffin recipes. Are you sure you didn’t use 1/2 tablespoon on accident? I hope the saltiness mellows out for you! Definitely scale back a bit next time. Kate yesssss! I just got way too many strawberries from a relative today and needed something to make with them. You rock! Sending love your way. mot gluey which happens often with muffins and GF free. Husband ate two, which is a sign of approval! I’m sorry to hear they didn’t rise! What gluten free flour did you use? I’m happy they were still delicious. I use the Bobs Red Mill all purpose GF blend but I’ve never had much luck with any GF baked goods rising. I will totally make them again though — delicious. So looking forward to making this recipe. Only thing I wonder about for sweet muffins is the olive oil. Could any given olive oil impart an unwanted flavor? Hi Nadenia, as long as your olive oil hasn’t gone bad (rancid), the olive oil add a light-to-imperceptible flavor. You can also use coconut oil, which will impact the nutrition profile but it will work just as well as olive oil. Thanks! Very reassuring. Especially with baked treats, we aim for best nutrition profile possible. So, we’re in! Wish that strawberry muffin had a gluten free alternative. It looks delish! You could try substituting a gluten free flour for the whole wheat flour. 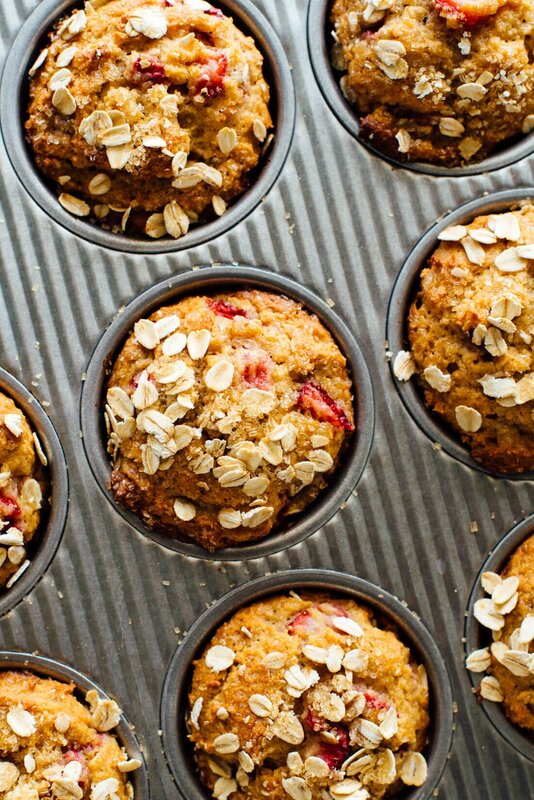 I am a huge fan of your recipes but the Strawberry Oat Muffins were not a hit in my household. Although they smelled delicious, the texture was extremely gummy and the taste was bland – despite all the sweet strawberries. Luckily I also made your delicious pecan granola so that compensated for the muffins. Marlene, I’m so sad to hear that! I made these muffins at least eight times to make sure they were just right. Did you use the flours specified in the recipe, or did you substitute another flour (such as a gluten-free flour blend)? I hope they tasted better after they rested for a few hours; baked goods typically do have more flavor after a rest. Another great recipe – Thank you Kate!Easy to make and delicious.These will be frequently made at our house.Made with whole meal spelt flour and they turned out great. Another winner! Perfect texture and just enough sweetness. Thank you. Have you, or any of your followers, prepared this recipe using strawberry greek yogurt instead of plain yogurt? I have not. It would likely increase the sugar content here and sweetness, since flavored yogurts have more sugar based on the fruit puree typically added. How well would these freeze? 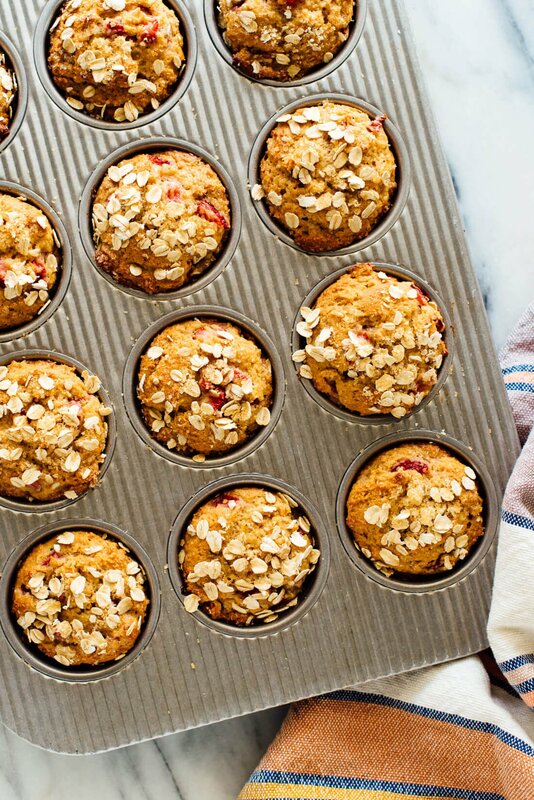 Store leftover muffins at room temperature, covered, for 2 days, or in the refrigerator for up to 5 days. Freeze leftover muffins for up to 3 months. Made these as written. Rather bland. Fresh strawberries tasted great, baked , just gooey. Where is the nutrition information? I’m sorry you felt that way, Gretchen. The nutrition information is under the notes section of the recipe. You just need to click to expand. Sometimes ovens can vary. How long did you bake them for? These are the best muffins I’ve ever had! They are sooo healthy too! Thanks for another awesom recipe! I’m so happy to hear that! Thanks so much, Bailey. Went strawberry picking yesterday so I knew I had to try this recipe. I wasn’t sure about using olive oil, but I couldn’t even taste it. Added cinnamon and freshly grated nutmeg – delicious!! Fresh strawberries you picked would make this even better! Thanks for sharing, Eve. Hi Kate! This is the first recipe I made from your blog. I followed the recipe exactly (other than substituting the maple syrup for agave) and during the baking process everything seemed fine. However after baking the insides of the muffins were soggy and uncooked… but the outside was fine. I think it was because I put too many strawberries? I’m not sure. Anyways I’m gonna try your other recipes too I can’t wait! Erin, thank you for your note and I’m sorry your muffins didn’t turn out perfectly! Perhaps they needed another minute or two in the oven? Did you use the flours called for in the recipe, or did you substitute gluten-free flour perhaps? I used regular white flour and even went beyond the 22 min baking time. I’m gonna try it again but this time with dried fruit. I’m hoping to make these soon but I live overseas and maple syrup is hard to come by here. Think brown sugar would be an ok substitute? I made this recipe this weekend, and even my husband who does not like strawberries thought it was good! They were perfect and now one of my very favorite muffins I have ever made! Hooray! Thank you for the comment and review, Amy. These are really good. I added chocolate chips (because I add chocolate chips to everything) and they are delicious. The batter stays soft and the abundance of berries makes them nice and sweet. Chocolate chips are usually a great addition. Thanks so much Jeff, for your comment and review! I’m about to make them today, mmm. I wonder about making them as a cake, just so I don’t have to clean the muffin tin. thanks for posting this, and I love all your recipes! follow up on making them as a cake – it worked great! Baked for 35 minutes at 400. No guilt eating for breakfast! Glad to hear it! Thank you for getting back to us, Nancy! What a friend! Thanks for sharing, Nancy. I appreciate the star review. Made these last Sunday. They were just fabulous. I said “were” because they’re completely gone. My husband had 2 of them as soon as they were cool enough to eat. I love that! Thanks so much, Winnie. These muffins tasted wonderful! They were a bit too moist in the middle, but got better when they were cooled. I used a gluten free flour. What did I do wrong that made them so gooey in the middle? Thanks, Shirl! It sounds like maybe your muffins needed another minute or two in the oven. If that doesn’t do the trick, it must be due to your gluten-free flour blend, and maybe a different brand would perform better. Those can be tricky! These came out very good, I like that they are just slightly sweet and not too sweet. I used coconut oil and regular yogurt (didnt have greek). It yielded more than 12 muffins for me. Thanks! Great! Thank you, Dena for sharing. Is it possible to make this recipe with steel cut oats instead? Old fashioned really work best here as steel cut are denser and won’t bake the same. Looking forward to baking these for my twins tomorrow! Just wanted to check if I could use steel cut quick cooking oats instead of the old fashioned ones? You want to use old fashioned for this! Sorry. Amazing. Delicious. Healthy. Easy to make. Not too sweet. Absolutely a wonderful recipe!!!! Lovely! Thanks for your review. the wet ingredients, so no whisk involvement! Thanks for sharing, Elizabeth! I’m so happy you like the blog and cookbook. :) I appreciate the review. I made these today, and we really enjoyed them! I used regular whole wheat flour and the batter tasted a bit sour/bitter… but the muffins turned out fine. They’re not sweet except for the strawberries and sugar on top, so I’m glad I added a generous amount of raw sugar on top. I’ve been wanting to make this recipe since you posted it, and this morning I finally did! These are soooo good. I didn’t have quite enough strawberries (I was 1/4 cup short), but they still came out delicious. I added a smear of peanut butter to the muffin I ate this morning, for a little extra protein before my run. Thank you for another AMAZING recipe! You’re welcome, Shannon! I appreciate your review. These were amazing. I used brown rice flour and they turned out GREAT. My friends gobbled them up! Thanks so much; I’ll keep this recipe forever! Thanks for sharing! I’m glad you enjoyed it, Julie. Do you think frozen strawberries would work in these? Hi Miranda! Fresh strawberries do work best here. The frozen strawberries might be too watery to start. These muffins sound so yummy! Making soon…really appreciate the vegan options! Can the strawberries be frozen? Fresh work best here. Frozen can release too much juice from the start. I’m going to be that annoying person that has too many questions. 1. Can I use frozen strawberries? Do I just need to thaw first? 2. If I have vanilla greek yogurt already, can I just use that and forget the vanilla extract? 3. If I don’t have maple syrup, is there a substitute I can use if I’m too lazy to go to the store? Hi Heather! I’m sorry, I’m probably too late in the game here, but you could probably use defrosted frozen strawberries, you could use vanilla yogurt and drop the extract but your muffins will be quite sweet, and you can use honey instead of maple syrup. Thanks for sharing! I’m glad you were able to use a local ingredient you like! I don’t know what went wrong with this recipe. I’m rating it a three because it’s quite possible it was user error. My muffins came out flat as hell and still quite not baked inside even though they were in the oven for past the max time limit. I was thinking maybe the wetness of the strawberries affected the insides? I know when I make your carrot-based ones, I usually squeeze out some of the liquid from the carrots. Still, I appreciate your innovation. Thanks! Hey Jaylee, I’m sorry to hear that! I actually think this is a leavening issue, since your muffins didn’t rise properly. Any chance you left out the baking powder and/or soda, or got the quantities mixed up? That would be my first bet. Ridiculously good. My girls think they are dessert. Used Costco frozen sliced strawberries and worked out great. My daughter just grabbed another as a movie snack! Thank you again for a fantastic healthy recipe that I don’t have to fight my kids to eat. Finally a gluten free muffin moist and full of flavor. I made these muffins with my 3 year old granddaughter blueberries and strawberries and everyone loves them! I am trying to find healthy recipes without whole wheat or white sugar. The maple syrup was just enough flavor for both types of muffins and the extra virgin oliveoil was an added healthy ingredient. I wondered if the extra virgin would create an unacceptable flavor, but it did not. I will look for more of your healthy recipes! Thank you! Hooray!! I’m really glad these worked so well for you, Delorah. This sounds delicious. I’m not sure how I feel about the whole wheat flour. Would this also work with regular flour? Would I use the same amount? I haven’t tried it, but you could try it. 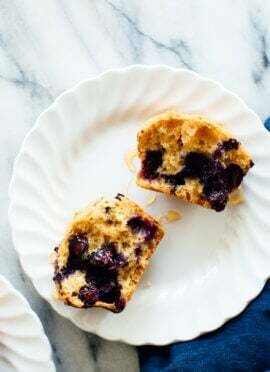 I just discovered your blog and made your blueberry muffins this morning. They turned out great! Can I substitute honey for maple syrup in this recipe, or do you think the maple syrup is the best way to go? Honey would work too, Rosemary! Thank you! In that case, I would need to reduce the temperature, right?